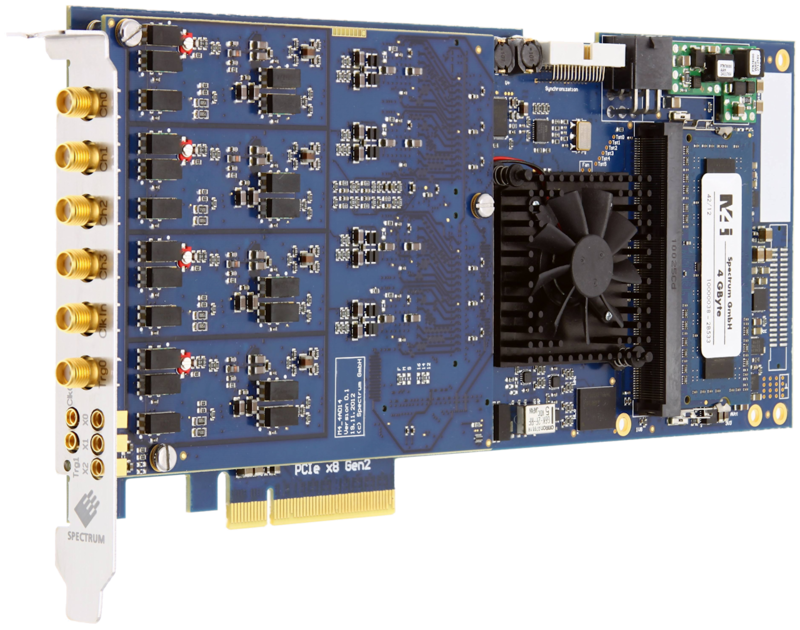 The 10 models of the M4i.44xx PCI Express (PCIe) series are designed for the fast and high quality data acquisition. Each of the input channels has its own A/D converter and its own programmable input amplifier. This allows to record signals simultaneously on up to 4 channels with 14 bit resolution (500 MS/s version) or 16 bit resolution (130 and 250 MS/s version) without any phase delay between them. The extremely large on-board memory allows long time recording even with the highest sampling rates. All boards of the M4i.44xx series may use the whole installed on-board memory for the currently activated number of channels. A FIFO mode is also integrated on the board. This allows the acquisition of data continuously for online processing or for data storage to hard disk.